KalmAid Anxious Pet Remedy is an effective fast acting liquid which promotes relaxation and reduces nervous irritability, useful for situations such as lightning, thunder, firecrackers etc, anxiety due to separation from owner or new environment, fear of travel or unwanted unruly behaviour. KalmAid Liquid has been given a tasty caramel flavour to make it more palatable and easier to administer. Mode of Action: KalmAid contains L-Tryptophan and L-theanine, which cross the blood brain barrier and affect the central nervous system. L-theanine works by stimulating alpha waves. 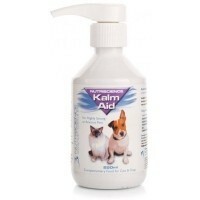 When my senior dog began having panic attacks with no obvious trigger the vets at PDSA recommended KalmAid. What a difference it has made to both our lives! Bob licks it off a spoon and I can't give it to him quick enough, to him it's a treat not medicine. Have been using daily for well over 6 months in conjunction with an Adaptil Collar. Panic attacks are now very rare and Bob's so much more content after spending much of his life since he was rescued frightened of any loud noises. If you have a nervous dog, I would definitely say to give this a try.